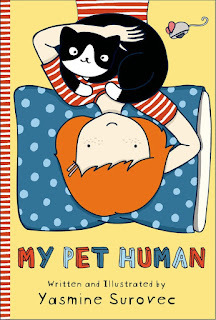 So, there's only one book in this review for September; but it was an adorable, adorable read! My Pet Human is freaking adorable! I love every little bit of it; from the expressive black and white illustrations, to the cat's eye view story about humans. Oliver is the best kitty narrator as he describes his training of the little Freckles. His adventures through the neighborhood trying to help his human make a new friend are just the right blend of humor and emotion. Definitely a must for any kitty loving child, or any kitty loving adult! I can't wait for the next installment in Oliver and Freckles' adventures in pet ownership. Plus, Surovec has some other equally fantastic looking books all about cats, and their shenanigans with us humans, and a website featuring her hysterical comics - Cat vs Human.